In keeping with our exploration of butoh leading up our November 5 & 6 presentation of Sankai Juku, today’s eye candy has… a bit of an edge. Sometime the beautiful is deliberately grotesque, and sometime there are moments of grotesqueness in ostensibly beautiful art forms. 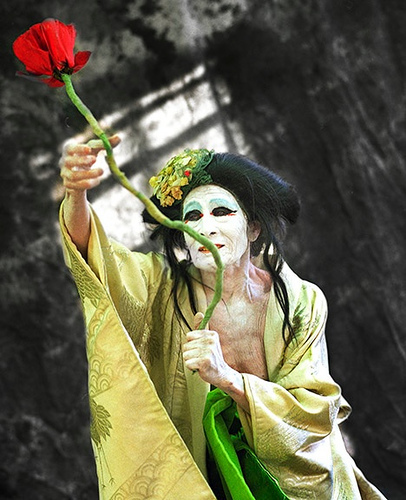 Here is more Kazuo Ohno for you, as he really did establish an utterly new art form in butoh. Kazuo Ohno was born in Hokkaido in 1906. Ohno studied with modern-dance pioneers Baku Ishii and Takaya Eguchi, but in 1938 he was drafted into the army, serving in the army for 9 years in China and New Guinea, where he was held for over a year as a prisoner of war. Ohno held his first recital, Jellyfish Dance, in 1949 when he was 43 years old, having resumed dancing as soon as he returned to Japan. This performance was thought to be a meditation on the burials at sea that Ohno observed when returning from New Guinea, the graves marked by the presence of jellyfish in the water. The artist Tatsumi Hijikata was so impressed by Ohno’s performances that he adopted him as his muse, together developing Ankoku Butoh-ha – ‘the dance of utter darkness’ – rejecting the popular Western dance forms of the time. His last international performance was Requiem for the 20th Century, held in New York in December 1999. From this point, Ohno’s physical health, sight and strength began to wane, until finally he danced simply with his hands, eyes and breath, famously asserting, ‘Even upon taking leave of my flesh and bones, I want to continue dancing as a ghost’. ~ by DanceHouse on October 18, 2010.